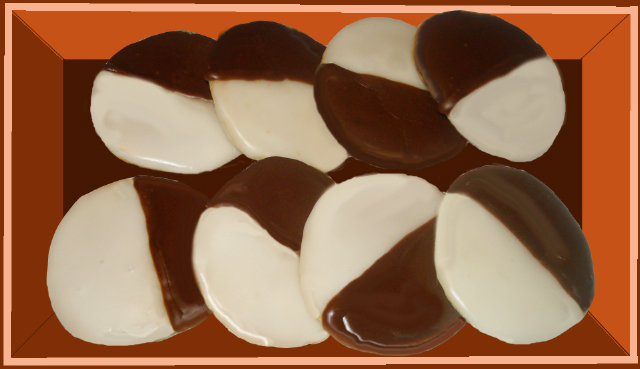 Black and white cookies are another one of my go to recipes. I’ve noticed them making a come back lately and they’re one of those retro cookies that everyone loves. Maybe it’s a childhood thing, but I think they’re more of a New York thing! I love giving these cookies in care packages and they look great on dessert buffets at parties. They only contain a few ingredients and I think that’s what makes them so good. The key ingredient in this recipe is buttermilk. It keeps the cookie light, super moist, and it’s one of my kitchen staples. To put my own spin on the icing I use Valrhona cocoa powder to add a depth of flavor to the chocolate half. I add lemon juice to the vanilla half to cut the sweetness and balance the flavors. I also make them miniature partly because they look so cute, but mostly because if you eat a few minis it doesn’t feel as bad as devouring one of those jumbo ones! Add dries alternating with buttermilk. Portion dough on cookie sheet using a small ice cream scoop and bake at 350 degrees for 10-12 minutes till tops are puffed and slightly golden. Finished dough. I suggest chilling at this point for about 30 minutes to make portioning easier. Ready for the oven. While they are baking I prepare the icing. Mix 10x, lemon juice, corn syrup, vanilla, and water. If you notice the icing is too thick add more water to get the right consistency. Spread vanilla icing on half of the flat side of the cooled cookies. When you have finished icing all the cookies add the cocoa powder to the remaining icing. Once again at this point you will probably need to add an additional 1-2 T. of water. Spread chocolate icing on the cookies and allow them to completely set in a cool dry place. These cookies will keep in an air tight container for 2-3 days. Finished product perfectly iced and ready to eat! >These look great! I'm definitely getting a black and white cookie craving after seeing so many of these pop up lately! >Delicious. Very beautiful cookies. Thank you for sharing, I really love cookies!! >Absolutely gorgeous black-and-white cookies, as we call them. I bookmarked the recipe. They almost look too perfect. Love the recipe, and the finished result. >Oh, and BTW…TAG! You're it!!! >Your cookies are perfect! The last time I made black and white cookies they did not look that good! >Thank you for the stylish blogger award! Very sweet! >I love your heart shapped measuring cups!! And the cookies look amazing too!! >These cookies look really good!